Merging Premier Brands With Internet Retail. 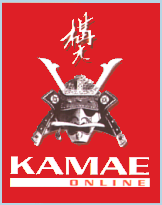 For over 25 years Kamae have been providing a first class service to the martial arts community with premier brands of clothing and kit. OverGi and warm up tops. Kaiten Karate suits and products. All of the products are of the best quality available for the martial artist and the service is second to none. The embroidery service is available for any of the garments and the embroidered silk black belts are amongst the most popular of the products being of the highest standard available. To browse the website please click on the banner link above or below. © 2001-2019 K300 Ltd. All rights reserved.